Gogo Internet Wi-Fi on American Airlines Flights Rocks! Every now and then, I am truly amazed by a new experience with technology. 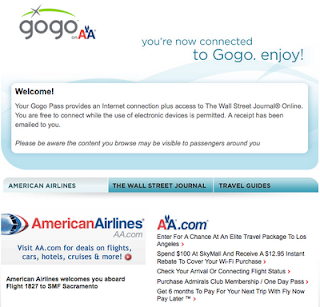 After signed up on an American Airlines flight with Gogo Internet Wi-Fi Service on a free promotional one day trial offer ($12.95 per flight/$24.95 per month regular price). While the plane was in flight, I checked my email, facebook, twitter then decided to try and answer the question, what will the airlines allow you to do and not to do. 1. Email - I was able to retrieve my POP email and send messages from my Google account. 2. AOL AIM - I found my daughter on AIM and did a video chat with her. She then added the W or my wife and we did a 3 way video chat. They could not hear me from my microphone which might be an issue with my MacBook Pro but I could certainly hear them. How cool is that! 3. Skype - I tried to dial a land line and struck out. I did sent a text message for a small fee. I just left the Dallas Fort Worth Airport on American Airlines headed West toward California and saw the sticker as I was boarding the plane that the S80 Aircraft has wi-fi. 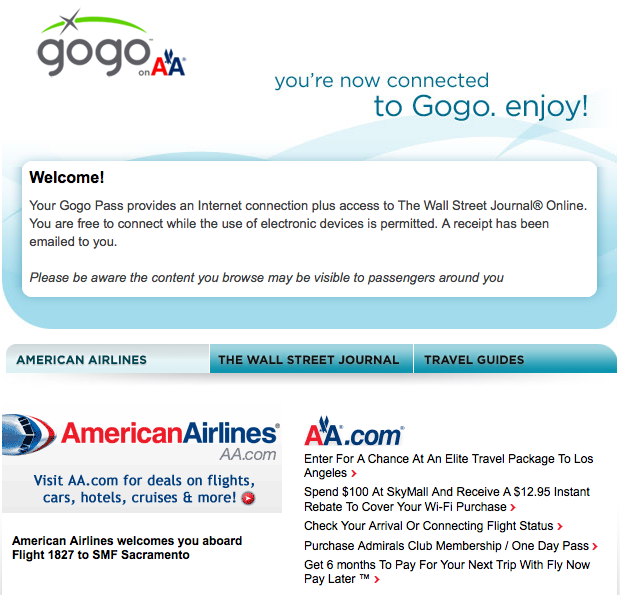 American Airlines uses the Gogo Inflight Internet wi-fi service. Luckily, the last time I was in the Admiral's club, I found a Free Wi-Fi coupon on the table and stuck it in my wallet. Believe it or not, I fired up my laptop, clicked the Buy One Day Pass button ($12.95 per flight), entered some profile info and my promo coupon code and without entering my credit card info, I am now online! This is very cool!